Last week at our "Equip" event, I picked up a couple free books which Kevin Boer had brought as give-away items for the volunteers in attendance. There were more than enough books to go around so I grabbed some for my shelf. A few days ago, I picked up one of them; Toward a Prophetic Youth Ministry by Frenando Arzola, Jr. I was hesitant as to whether or not it would have any practical implications for my own ministry context, being that it is written for an "urban context" and I am in a more rural context. It became apparent in the early pages of the book that it was not just another youth ministry book. It turned out to have tons of cross-over and points of entry for any ministry context. The book provides a paradigm shift away from "traditional youth ministry," away from "liberal youth ministry," away from "activist" youth ministry, and toward prophetic youth ministry. it's a call away from the extremes and toward a holistic ministry which starts from the ministry of Christ rather than from any narrow agenda, expanding into the personal, social, and spiritual growth of adolescents. 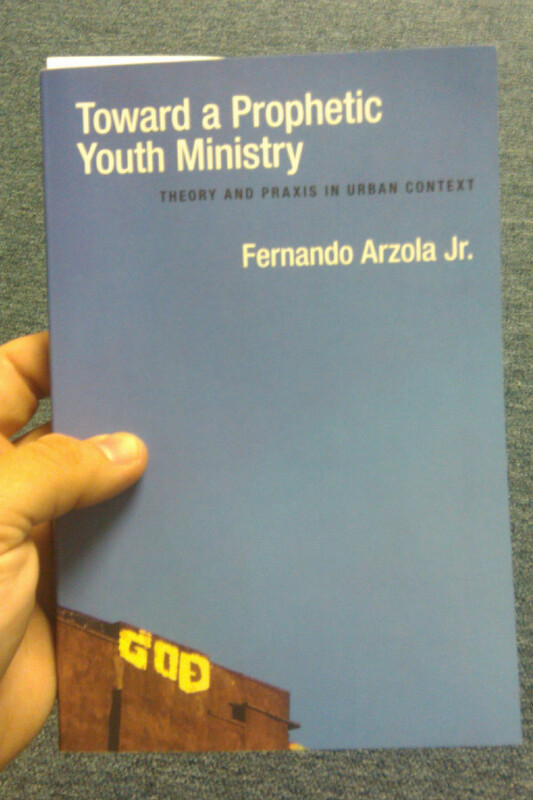 Taking advantage of the likes of Martin Buber, Gustavo Gutierrez, Virgilio Elizondo, and Kenda Creasy Dean, this book is an awesome resource taking both the theory and the praxis of youth ministry very seriously. Useful for the academic mind and accessible for the lay reader, this book has huge implications for any ministry context. I was also pleased to see that one of my old professors from APU, Amy Jacober, endorsed the book alongside Bart Campolo. You should really check this book out!